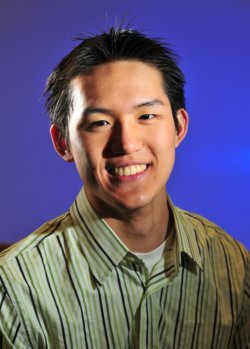 Johnson Ho, Macaulay Honors College Student and biomedical engineering major, recipient of the 2011 Barry M. Goldwater Scholarship. Johnson Shiuan-Jiun Ho, a junior biomedical engineering major in the Grove School of Engineering and Macaulay Honors College at The City College of New York, has been awarded a Goldwater Scholarship for 2011. The national award recognizes undergraduate students who demonstrate academic excellence and outstanding potential for future scientific research. This year the Barry M. Goldwater Scholarship and Excellence in Education Foundation selected 275 sophomores and juniors out of 1,095 students nominated by faculty from academic institutions around the country to receive the scholarship. It provides up to $7,500 per year to be used for undergraduate tuition, books, fees, and room and board. The scholarship is intended to encourage and support scholars with exceptional promise in the pursuit of careers in mathematics, the natural sciences, or engineering. Past Goldwater Scholars have gone on to win Rhodes and Churchill Scholarships, Truman Fellowships and Marshall Awards. “It’s sort of like raising a flag above Johnson saying ‘this is going to be an outstanding researcher in coming years’,” said Robin Villa, director of the City College Honors Center. Mr. Ho is the fifth City College student to be awarded a Goldwater Scholarship since 2004. Two prior winners, Lev Sviridov (2004) and David Bauer (2007) went on to earn Rhodes Scholarships. Dr. Sviridov is currently a research associate with the CUNY Energy Institute based at City College. Strong in math and science in high school, Mr. Ho was torn between aspiring to a career in medicine or engineering when he applied to college. Prestigious institutions vied for his favor, but he was attracted to the intense, specialized instruction Macaulay Honors College offers. City College’s biomedical engineering major allowed him to pursue both passions at the same time, and the school just seemed to fit his personality, he said. Professor Marom Bikson’s research appealed to Mr. Ho because of the way it applied engineering solutions to medical problems for humanitarian purposes, and he became a member of his laboratory. Professor Bikson investigates how electricity works on the brain, and he develops technologies to improve electrotherapy. The technique stimulates the brain with electrical current delivered via electrodes attached to the scalp to treat intractable depression and the effects of stroke. Professor Bikson seems to have a knack for nurturing promising researchers: Itamar Belisha, a 2007 City College Goldwater Scholar, also emerged from his lab. As an undergraduate researcher in Dr. Bikson’s lab, Mr. Ho helped develop a technology to prevent the irritation and pain caused by existing electrotherapy devices. Previous electrodes consisted of two large, bath-sponge sized pads. Mr. Ho collaborated with lab members to develop a non-invasive, low-intensity, and portable brain stimulation device worn like a swim cap. He reengineered the two pads to create an array of small electrodes the size of earbuds that dot the cap. The group patented the technology and described it in the “Journal of Neuroscience Methods.” Mr. Ho has contributed to two research papers and two patents from the lab. Not one to waste free time, Mr. Ho has spent recent summers modeling heart mechanics at Mount Sinai School of Medicine and developing questionnaires to assess the effectiveness of a cognitive-behavioral therapy treatment plan on depressed patients at the Charles B. Wang Community Health Center in Flushing, New York. He is also a certified EMT and crew chief of the Volunteer Emergency Squad on campus, an avid varsity volleyball and track athlete, and founder of an Athletes in Action chapter on campus that helps develop leadership skills. Mr. Ho aspires to become a Rhodes Scholar and pursue a joint MD/PhD degree.